China commissioned its first aircraft carrier, the Liaoning, on September 25, 2012. It was a milestone that owes much to the vision of Admiral Liu Huaqing, who commanded the Chinese navy – formally the People’s Liberation Army Navy – from 1982 to 1988 and served as a vice-chairman of the Central Military Commission until 1997. In those positions, he helped shape China’s maritime outlook and shift its navy from a coastal defense force to one capable of projecting power into the western Pacific. Liu argued that for the navy to fully transform it had to have an aircraft carrier. Ultimately he prevailed over resistance from the army and within his own service, though he did not live to see the Liaoning underway at sea. While the aircraft carrier is not a revolutionary combat platform today, it remains symbolic of a navy that has reached the world’s first rank. Since China accelerated its naval modernization in the 1990s, its shipyards have produced scores of new vessels that range from nuclear-powered ballistic missile submarines to amphibious assault ships. And over that time, Chinese naval engineers have had many opportunities to study aircraft carrier design—including decommissioned foreign aircraft carriers that Chinese entities acquired as well as the information gleaned from various exchanges. In one such exchange in 1995, Spain’s Empresa Nacional Bazan, which built the light aircraft carrier Chakri Naruebet for Thailand, offered China plans for a similar ship. Chinese officials also inspected and received bids for other retired aircraft carriers, such as France’s Clemenceau in 1996 and Argentina’s Vienticinco De Mayo in 1997. China ultimately chose to refit Russia’s Varyag, the second Kuznetsov-class aircraft carrier. Yet by the time it finally undertook its first sea trials in August 2011, the ship already had a long and serpentine history. Laid down in 1985, it was originally meant to serve as part of the Soviet navy’s oceanic fleet. But after the Cold War ended and the Soviet Union disintegrated, the ship was left unfinished at a Ukrainian shipyard. Reports soon surfaced of Chinese interest in the vessel as early as the summer of 1992. 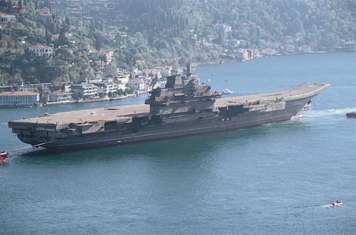 However, its sale was not completed until 1998 and four more years would pass before the aircraft carrier completed its journey from the Black Sea to a Chinese naval shipyard in Dalian. Only in the last half decade did online images posted by Chinese enthusiasts reveal that the shipyard had begun to refit the long-dormant ship. China’s naval chief finally validated that speculation in June 2011. Even so, doubts about the ship’s eventual battle-worthiness remain. Despite its refit, most of the Liaoning’s major systems are still the same as those aboard its Russian sister ship, the Kuznetsov, which has been noted for its high number of maintenance problems and low number of days at sea. Such criticisms are not new. Doubters have long challenged advocates of China’s aircraft carrier program. Such debates have been the fodder for Chinese and Western observers as well as within the Chinese navy itself for two decades. Here we will summarize the strongest arguments of both camps. Why Is an Aircraft Carrier a Bad Idea? High cost. Building or refitting an aircraft carrier is expensive. India’s recent refit of the smaller Kiev-class Admiral Gorshkov has cost over $2.3 billion. Early estimates for the refit of the Varyag placed the cost at roughly $2 billion, leading some experts to believe China would not pursue it at the time. And beyond the construction or refit of the aircraft carrier, there is the annual cost associated with maintaining it. The annual operating cost of the Royal Navy’s new conventionally-powered Queen Elizabeth is estimated at $70 million and its annual life cycle cost approaches $160 million, which incorporates both construction and mid-life overhaul costs. Of course, a fuller financial accounting would encompass the cost of construction and maintenance for not only an aircraft carrier, but also a carrier battle group, which is needed to enable the ship to operate in a combat environment. Along an American model, that would entail anti-air destroyers, antisubmarine frigates, submarines, fast support ships, and most importantly an air wing of fighters. Hence some have argued that China could pursue another model: an aircraft carrier capable of a limited range of missions with a defensive screen of moderately-capable warships. But given the Chinese navy’s building program which has iteratively produced more technically-sophisticated ships—including the August 2012 launch of another Luyang II-class destroyer with an improved phased-array radar—the navy seems committed to pursuing loftier ambitions for the moment. High opportunity cost. Whatever the total cost for an aircraft carrier and its associated hardware, those resources would invariably come from other segments of the Chinese navy’s budget. As a result, the navy may be forced to forego other acquisitions, such as additional nuclear-powered or diesel-electric submarines. And since many of the skills required for aircraft carrier operation are not applicable to the rest of the navy, it must create and maintain special schools and infrastructure, siphoning off more resources from other naval branches. While in an era of expanding budgets, this may be a secondary concern, once budgets become tighter, maintaining capabilities will become harder, as many European navies can attest today. High technical complexity. Chinese naval shipyards have surely come a long way in designing modern combat platforms. This spring the People’s Liberation Army Daily even reported that a prominent naval engineer had begun work on an electromagnetic aircraft catapult of the sort that will be installed on America’s newest Gerald R. Ford-class aircraft carriers. But, even as ships of ever-increasing tonnage continue to slip from Chinese shipways, none have yet incorporated specialized equipment like catapults, arrestor wires, and aircraft elevators. Such technologies require substantial resources to learn how to build and integrate with other systems. Even the technical challenges necessary to refit a 20-year old aircraft carrier, like the Varyag, likely took a decade to master. Moreover, Chinese naval officers will have to learn a completely new field of naval warfare to actually operate a carrier battle group. While many have participated in flight-deck operations courses that have been held regularly since 1989, they will also need to learn how to conduct and control maritime operations from an aircraft carrier as well as how to handle a carrier battle group as an integrated unit. Limited operational value. Commentators who favor other uses for the Chinese navy’s resources often note that an aircraft carrier would be vulnerable to submarines and mines—becoming a “floating coffin.” Instead, they argue that the resources needed for such a ship would be better used to build and support combat platforms that are less susceptible to detection and destruction, like nuclear-powered and diesel-electric submarines. In a similar vein, many Western experts have opined that in an open conflict against a modern foe a Chinese carrier battle group could fast become a magnet for anti-ship cruise missiles. In addition, an aircraft carrier does not fit particularly well with China’s military requirements for a Taiwan contingency or its other sea denial strategies in the western Pacific. Given that the Liaoning is a medium-sized aircraft carrier, it will likely embark few more than 20 fighters. Certainly it could provide air cover for a naval force at sea. But, if built without catapults, its fighters would be unable to carry the heavier combat loads necessary for long-range strike missions. And since Beijing’s principal concern has traditionally been Taiwan, which lies about 200 km offshore, the Liaoning’s fighter complement would not meaningfully add to the hundreds of Su-27 and J-10 fighters based across the Taiwan Strait. Weaken China’s strategic environment. More strategically-minded observers worry that the Liaoning will alarm China’s neighbors and trigger them to more closely align with the United States or embark on their own military buildups. Of course, both have now occurred—though more likely this is a consequence of China’s renewed assertiveness in the East and South China Seas rather than its new aircraft carrier. Over the last three years, Japan, the Philippines, and Vietnam have all sought stronger military ties with the United States. Japan also made an important shift in its national defense policy in December 2011, away from a posture oriented to deter Russian actions to a “dynamic” one that can better respond to seaward threats to the south. To that end, Japan has laid plans to expand its submarine fleet from 16 to 20 boats for the first time since the 1970s. The Philippines and Vietnam have also embarked on their own ambitious military recapitalization efforts that involve new combat aircraft and warships. Why Is an Aircraft Carrier a Good Idea? Better power projection. Certainly an aircraft carrier provides China with a mobile base at sea from which its combat aircraft can undertake a wide range of missions at a reasonable cost. Without one, it would be difficult for China to project power into areas far from its shores. Its conventionally-armed ballistic missiles—though numerous and increasingly accurate—have the long range, but remain relatively expensive, single-use, and single-purpose weapons. And, of course, missiles cannot assume non-kinetic missions, such as presence, patrolling, or conducting relief efforts, like those needed in the aftermath of the 2004 tsunami in Indonesia or the 2011 earthquake in Japan. Within days of both incidents an American aircraft carrier, the Abraham Lincoln in the first and the Ronald Reagan in the second, rendered much-needed disaster assistance. Better protect sea lanes and maritime claims. As many Chinese observers have contended, an aircraft carrier could help secure China’s sea lanes, which have grown in their importance as the country’s overseas commerce has expanded. But, as in any military context, a warship’s ability to perform that task is also dependent on its adversary’s capabilities. If its adversary’s aviation assets are more formidable than those aboard the Liaoning, then the ship’s utility is lower. However, in the case of the South China Sea, a medium-sized Chinese aircraft carrier with a fully-capable air wing could match most Southeast Asian air forces of today and improve China’s ability to exert sea control in the waters around the Spratly Islands. Promote national pride. Just as countries around the world have come to see skyscrapers as symbols of national economic and engineering dynamism, they also see an aircraft carrier as an emblem of national attainment. Unlike the other arguments for and against an aircraft carrier, national pride has less to do with a vessel’s actual capabilities than with its intangible meaning to the country as a representation of its status. As recent Chinese protests over the East China Sea Islands called Diaoyu in China and Senkaku in Japan remind us: overcoming China’s “Century of Humiliation” (1842–1945) still holds great resonance among its populace. What Aircraft Will China’s Aircraft Carrier Embark? As spirited as the debate over the utility of an aircraft carrier for China has been, a similar level of speculation has surrounded what aircraft the Chinese navy will choose to embark on its aircraft carrier. Those who figured that the navy would acquire a light aircraft carrier argued that the Yak-141 vertical-takeoff-and-landing fighter would be the most logical choice. But in 2005, reports emerged that outlined China’s interest in procuring as many as 48 Su-33 fighters and carrier training for 50 pilots. The potential purchase of Su-33 fighters, a fixed-wing naval fighter capable of short takeoffs from a ski-ramp flight deck, suggested that China’s first aircraft carrier would be somewhat larger and that a refit of the Varyag was a real possibility. Then in 2010 Chinese newspapers began to report on the development of a naval variant of the land-based J-11 fighter, China’s version of the Russian Su-27 fighter. The following April, China unveiled that naval variant as its J-15 fighter, which possibly has features integrated from an Ukrainian Su-33 prototype that China acquired. As part of that acquisition, China reportedly also purchased the materials associated with the developmental work on the airframe so that its engineers could better design some key components, such as landing gear. Overall the J-15 may be well suited for air superiority missions, though its range is likely to be shorter than that of the J-11 due to its need to be sufficiently light to takeoff from the Liaoning’s ski-ramp flight deck. For the same reason, its combat load is likely to be lighter as well, making it more difficult to carry the same heavy ordinance needed for strike missions. Online images in 2011 seemed to confirm the Chinese navy’s choice of the J-15 fighter as its frontline carrier aircraft. These images showed J-15 fighters on the flight line at Yan Liang air base, which many suspect is China’s flight test and evaluation center and where a ski-ramp flight deck similar to that aboard the Liaoning has been built. Later that year, more images revealed J-15 fighters conducting low-level passes above the Liaoning, though they did not touch-and-go or attempt an arrested landing. And in early 2012, calibration models of a J-15 fighter and a Z-8 helicopter appeared on the vessel’s flight deck. What Hurdles Remain to the Liaoning from Reaching Initial Operational Capability? Although the Liaoning has been commissioned, it has not yet reached initial operational capability—that is, to achieve minimal combat readiness. Certainly the ship’s basic systems are functional, after having undergone at least ten sea trials since it was launched over a year ago. During that time, the naval shipyard in Dalian had had to make a number of repairs. On one occasion, it even stripped away the aircraft carrier’s flight deck surface so that its undersurface could be re-coated with zinc-chromate primer. Shipyard sources also reported that the ship’s propulsion system required attention—unsurprising given that its sister ship has had chronic power plant problems. But some of the components vital to its operation as an aircraft carrier may still be missing. These include arrestor wires that carrier aircraft need to land on a flight deck. Rumors indicate that China tried to purchase the wires from Russia, but was rebuffed as a result of Russian irritation over Chinese reverse engineering of the Su-33 to create the J-15 naval fighter. Still other rumors assert that China have since been able to acquire arrestor wires from Ukraine. In any case, arrestor wires may only be one notch of a higher hurdle to the Liaoning from reaching initial operational capability—the readiness of the J-15 fighter and its pilots to safely takeoff and land on an aircraft carrier flight deck at sea. Notwithstanding its pilot training at Yan Liang air base, China may still lack some of the key knowhow to develop the facilities needed to test the J-15 airframe and train its carrier pilots. That possibility came to light after Ukrainian authorities discovered Chinese espionage to collect data on its Nazemniy Ispitatelno-Tryenirovochniy Kompleks Aviatsii carrier aircraft training center at Novofedrovka as late as 2011. Such revelations naturally led to more speculation about the progress and timing of China’s aircraft carrier program. But Chinese President Hu Jintao put the spotlight on the navy in December 2011, when he urged deputies to the navy’s Communist Party congress “to accelerate the transformation and modernization of the navy.” Thus, even after China’s first aircraft carrier reaches its initial operational capability, it will likely only mark the beginning of renewed debate over whether China will build more aircraft carriers in the future. Observers will likely echo many of the same arguments made in support or opposition to its first aircraft carrier. In the meantime, for China’s political elite and many of its citizens, the Liaoning will be another symbol of national achievement. For its navy, it will be another combat platform to master and maintain. And for the admiral who never saw it at sea, it will be the realization of its dream. China’s Naval Modernization: Cause for Storm Warnings?